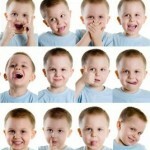 How do childhood experiences affect how we interpret facial expressions? Guest Author: Valentina Park Much of our daily, personal interactions are based on how we interpret the facial expressions of people we meet. On a basic level, when a person smiles we know we made them happy and when they look angry we may have offended them. This type of facial discrimination has become so second nature that we may forget this skill once had to be learned, developed, and practiced. Our personal experiences as children play an important role in shaping the way we read and interpret faces later in life (Fox, Levitt, & Nelson, 2010). To examine this idea, studies have been done to analyze the differences in facial recognition between children being reared in typical families and children being reared in orphanages. A child raised in an orphanage experiences chronic stress, receives minimal emotional attention, and does not have the opportunity to form secure attachments with people (Parker & Nelson, 2005). These atypical social interactions are theorized to cause deficits in the ability to understand the meaning of facial expressions later in life (Parker & Nelson, 2005). Consequently, orphanage-reared children may behave abnormally in social situations because they have difficulty interpreting characteristic cues and faces (Parker & Nelson, 2005). Children adopted from orphanages still experience traumatic early life stress and consequently have similar difficulties interpreting emotional expressions. This is because the social bonds formed during infancy continue to shape emotional functions throughout adulthood (Fries, Ziegler, Kurian, Jacoris, & Pollak, 2005). Specifically, brain systems responsible for regulating basic social behavior are directly influenced by early life stress. This suggests that early childhood is a highly critical period for developing facial discrimination techniques and shaping human interactions in the future. (Fries, Ziegler, Kurian, Jacoris, & Pollak, 2005). Studies also suggest a relationship between past experience with abuse and increased attention to angry faces. Children raised in abusive homes are more likely to focus their attention on an angry face and have difficulty disengaging from these faces (Pollak & Tolley-Schell, 2003). Moreover, they are more like to match any emotional situation to pictures of angry faces in experimental tasks (Pollak, Cicchetti, Homung, & Reed, 2000). Once again, this research suggests that our experiences as children shape the way we process faces later in life and thus influence how we understand social interactions and choose to behave. Interpreting facial expressions of other people is how we are able to understand and interact with society (Fries & Pollak, 2006). It should not be underestimated how important this skill is in influencing and shaping our daily social behavior (Cicchetti, Ackerman, & Izard, 2009). Early life stress and adversity can affect the development of this skill and lead to atypical interpretations of facial expressions later in life.